Amira Hass brings a fresh and much needed insight to the past, present, and future of Palestinian Israeli relations. She draws on 30 years of experience as an Israeli journalist and analyst who has sought and achieved unparalleled immersion in Palestinian communities in the West Bank and Gaza. Born in Jerusalem in 1956, Hass joined the Israeli daily Haaretz in 1989 and had been its correspondent for the Occupied Palestinian Territories since 1993. She has lived in the West Bank city of Ramallah since 1997. "Ramallah Chronicles", a compilation of her articles between 1997-2003, was published in 2005. Before taking up residence in the West Bank, Hass lived in Gaza for three years, which experience served as the basis for her widely acclaimed book "Drinking the Sea at Galilee". Hass is the only child of a Sarajevo-born Jewish mother who survived nine months in the Bergen-Belsen concentration camp, and a Romanian born Jewish father who survived three wartime years in a ghetto. Free and open to the public; call 312-583-7088 for questions. Join JVP-Chicago for a screening and discussion of “Imprisoning A Generation”. A 50 minute documentary following the stories of four young Palestinians who have been detained and imprisoned under the Israeli military system. Their perspectives, along with the voices of their families, combine to form a lens into the entangled structures of oppression that extend well beyond the prison walls. Following the screening, we will discuss the issue and how to best use the film to further the AFSC/DCI No Way to Treat a Child Campaign. RSVP to help us plan. New and old Jewish Voice for Peace-Chicago activists and allies are welcome. As always, refreshments will be served. All are welcome! Wheelchair-accessible location, a short bus ride from Chinatown Red Line stop. Join us to hear reports from our Working Groups. Learn about our current projects, priorities, changes and opportunities on how you can get involved. RSVP to help us plan for this event. 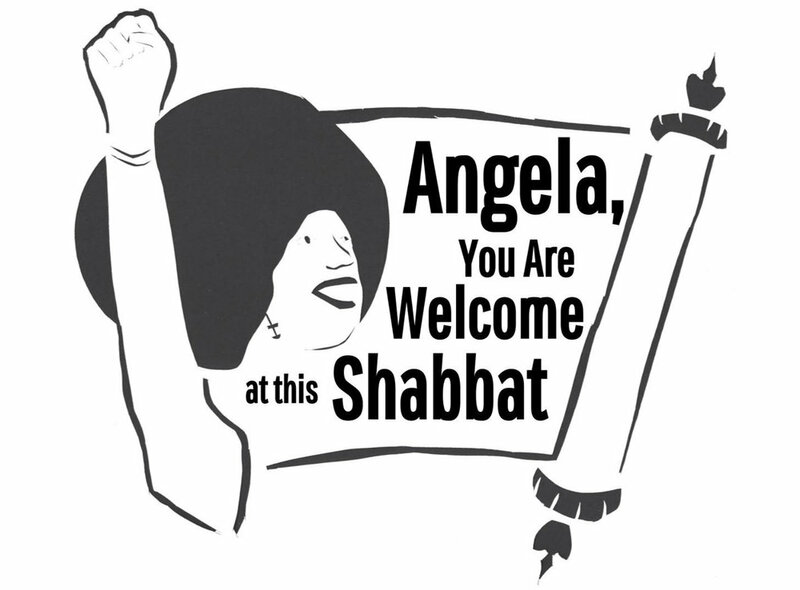 Join JVP-Chicago as we celebrate a Shabbat in Solidarity with Angela Davis! We will sing, light candles, break bread, and read together from the Torah of Angela Davis. Join us for a festive Shabbat committed to reinvigorating this vibrant spirit of solidarity. We ask that folks who can do so bring a dish to share--vegan, vegetarian, and gluten-free dishes would be highly appreciated. New and old Jewish Voice for Peace-Chicago members and allies are welcome. Bring a friend or two. All are welcome! Professor Davis has been unwavering in her commitment to upholding the legacy of Black and Jewish solidarity and has always acknowledged the Jewish tradition of working for justice that informs her politics, even, and especially, her support for Palestine. Join us for a festive Shabbat committed to reinvigorating this vibrant spirit of solidarity. We will sing, light candles, eat, and read together from the Torah of Angela Davis. When the Birmingham Civil Rights Institute offered Professor Angela Davis the Fred Shuttlesworth Human Rights Award and then rescinded that offer because of her vocal support for Palestinian human rights, the Birmingham community got in motion to plan an alternative community celebration for their hometown legend on February 16th. In response to pressure from grassroots organizing, the Institute recently reoffered the award to Professor Davis. On February 15, Jews in Birmingham, Alabama, are gathering to hold a Shabbat to welcome Professor Davis back to her hometown. They have asked us to gather as well to show our solidarity. Will you please answer their call by joining us? Across the country, from Birmingham to New York City, we gather to show our solidarity. Angela, You Are Welcome at this Shabbat. Bring a friend and dish to share. All are welcome. Where: Grace Place - 637 S. Dearborn Avenue. Share on Facebook and to help us plan, let us know that you plan on coming. Antisemitism in the U.S. isn’t just about overt discrimination or violent assault. It operates in daily life through stereotypes, unspoken assumptions, and ignorance of intersectional identities. Like racism, transphobia, and other forms of systemic oppression, antisemitism affects everyone, even if they’re not part of the targeted group. So what can we do? Ashkenazi Jews. We’ll also discuss ways of responding to different kinds of expression, from unexamined stereotypes to open attacks and provide resources for you to use. The training space is on the first floor and wheelchair accessible. ASL interpreters and other accommodations are available on request. This meeting will include discussion of JVP’s stance on Zionism. You can read the statement on the JVP web page. With Michael moving on to new responsibilities, we say hello to Ari Belathar. We will have light refreshments and plenty of opportunity to chat with Ari. RSVP for this Meet and Greet. This meeting will include a Trans-Affirming Workshop. Join us to discuss our efforts to urge Representative Jan Schakowsky of the 9th Congressional District to co-sponsor H.R. 4391, the Promoting Human Rights by Ending Israeli Military Detention of Palestinian Children Act, a bill that would prohibit U.S. aid to Israel from subsidizing the Israeli military's systematic mistreatment of Palestinian children in military detention - including torture, solitary confinement and separation from parents and lawyers. This is in a non-wheelchair-accessble private home. Location provided after RSVP. for a different Chanukah Celebration! We will have the traditional - latkes, dreidels and lighting of the menorah. We will work together to envision (and actualize) a world without police, prisons, borders or the Deadly Exchange of police training between the US and Israel. 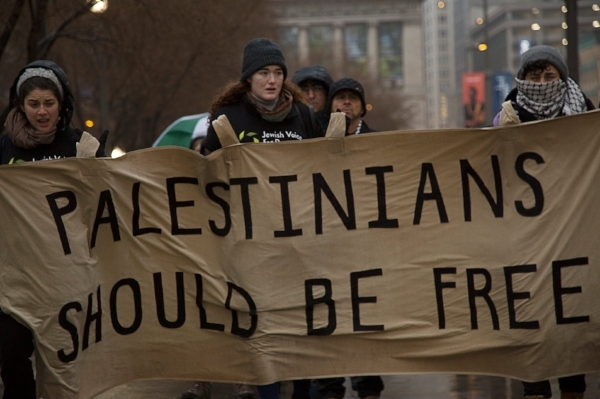 A world in which Palestinians and all people - from the US-Mexico border to Chicago to Hebron - are free. RSVP on Facebook. Feel free to invite your friends. If you want to help, you can email send an email to charemrosen@gmail.com or check out our sign-up list. Donations welcome, but not necessary. General focus of meeting is checking in, getting to know what’s up and thinking ahead for our future, especially in light of our new organizer, Ari Belathar. General focus of meeting is what we have accomplished in the last year and what we want to accomplish in the upcoming year. Please let us know if you are coming and whether you'll be at one of the working group meetings. SEIU - 2229 S. Halsted - Note the cross-town rivalry will be hot during the meeting So, adjust your travel plans accordingly. Join us at Chicago Sinai congregation (15 W. Delaware) as we protest "Sounding the Alarm on the American-Israel Relationship" sponsored by the Israeli Consulate, the Anti-Defamation League and Brand Israel. Let them know that we stand for justice for all. Get your friends and share on Facebook. 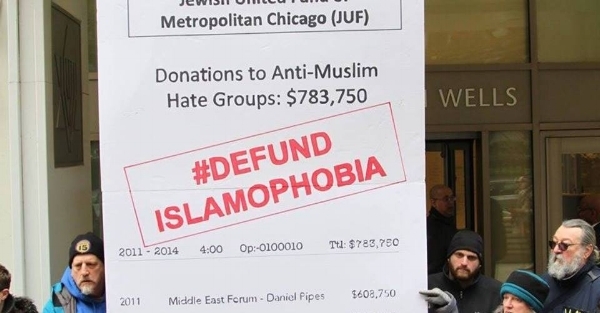 Please join us in letting the Jewish community and the greater Chicago community know that we do not support Israel and her apartheid policies. Let your friends know and promote on Facebook and elsewhere. Join us at a demonstration sponsored by the Coalition for Justice in Palestine to honor the memory of those killed protesting in Gaza. Let her know (especially if you are of her constituents) that the murder of unarmed civil protesters is unacceptable. Furthermore, the US is culpable for the support they provide Israel. Join us at this event hosted hosted by CJP. 500 S. Michigan Avenue., Chicago. JVP is endorsing this Palestinian led commemoration of 70 years since the Nakba. We will help to say it clear - Palestinians have the right to return to the lands from which they were expelled in 1948. Israel must stop killing protesters in the Gaza #GreatReturnMarch. 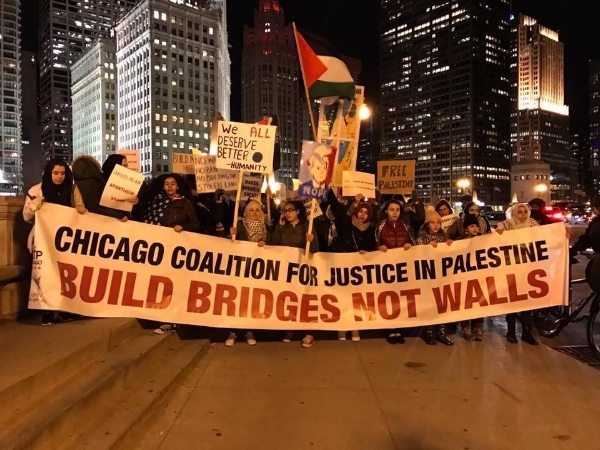 RSVP here to join the Jewish Voice for Peace-Chicago contingent at this event led by the Chicago Coalition for Justice in Palestine. We are proud to be listed as endorsers of this event. Since our last Vigil, more have been killed and the US has barely noticed. Show your support for those living and dying in Gaza. Let it be known to the world and your elected officials that you do not support Israel's killing of unarmed protesters. Show your support for those living and dying in Gaza. Let it be known to the world and your elected officials that you do not support Israel's killing of unarmed protesters. Vigil led by Rabbi Michael Davis and Lynn Pollack. JUF and the Israeli Consulate will be celebrating the 70th anniversary of the State of Israel with aconcert at the Harris Theater featuring David Broza. Join us to let the world know that the Nakba and ongoing displacement is nothing to celebrate. RSVP if you can make it and for more details. Let your representative see your outrage about the killing of unarmed humans behind a fence. Join American Friends Service Committee, American Muslims for Palestine and Jewish Voice for Peace-Chicago in Pilsen for a rally in support of the "Promoting Human Rights by Ending Israeli Military Detention of Palestinian Children Act," featuring one of the bill's current cosponsors, Representative Luis Gutierrez (IL-4)! The event will take place at 6:00 pm on the evening of Monday, March 12th at Lincoln Methodist Church at 2242 S. Damen St. (accessibility details below). RSVP HERE to help us track attendance and to make it easier for us to plan on accomodating as many people as possible! Seating will be limited. Please note - RSVPing does not guarantee seating. Representative Gutierrez will urge Members of Congress to join him and twenty-one other bill cosponsors in ensuring US taxpayer funds aren't being used to support human rights violations against Palestinian children detained by Israeli forces, to enhance transparency, and to demand that Israeli forces comply with international law. We're going to need volunteers! If you can help with sign-in, ushering, etc. please let us know at this link! We'll hear personal testimonies about the Israeli military’s mistreatment of Palestinian children from members of Chicago’s Palestinian community. The No Way to Treat a Child Campaign is coordinated by American Friends Service Committee and Defense for Children International - Palestine. RSVP HERE to join us on March 12 and be a part of moving the United States Congress closer toward ensuring U.S. funds are not subsidizing Israel's prosecution of 500 to 700 Palestinian children in military courts that lack basic safeguards for a fair trial each year. ACCESSIBILITY: The event will take place in the sanctuary on the second floor - unfortunately, it is not wheelchair-accessible as there is no elevator. There will be an overflow room on the first floor - must go over a small step to enter. Stay tuned for exact measurement on height of step. Organizers are working on live Spanish-English translation, stay tuned for confirmation. Join us this Friday, 2/16 to stop the forced deportations of African refugees from Holot Detention Center, the first set of which the Israeli government is scheduled to begin within a few days. An estimated 40,000 refugees are facing forced removal to Rwanda or other African countries where they will face persecution, violence, enslavement, or death. African refugees facing deportation will be protesting, and the Jews of Color Caucus Organizing in Partnership with JVP has issued a call for protests and vigils in solidarity in the U.S. and around the world. RSVP on Facebook and share widely to join us this Friday, February 16, at 4:00 pm at 500 W. Madison St.
Join us for a workshop on Anti-Semitism, facilitated by Sam Bick and David Zinman of the Treyf Podcast! Sam and David will lead us in a discussion on today’s dominant framework for understanding Anti-Semitism in North America. Together we will discuss the failures of this framework and how to work toward clearer understandings of the ways anti-Jewish marginalization intersects and interacts with other systems of oppression. — What is the dominant framework for understanding Anti-Semitism? — How does this framework fail us and our allies? — How can we bring a more intersectional understanding of Anti-Semitism into our political work? This workshop is structured to be a conversation among Jewish leftists but everyone is welcome to participate! Israel and Rwanda have reportedly signed a secret accord, in which Israel would pay the Rwandan government $5,000 for every deported refugee. Tell them both - human lives aren’t for sale! You can share your interest on Facebook. South Loop, Private Residence. Must RSVP for address.